Learn advanced JDBC, a data access standard for Java, on codeless configuration, SSO, debugging, and logging. ► What's in a Driver? Getting a basic Connection object from the database is the first operation to get a handle on. The code snippet below gets a connection to a SQL Server database. Note that the Class.forName line is unnecessary if you are using a JDBC 4.0 driver with Java SE 6 or above. The JDBC specification allows for fetching all data types using getString or getObject; however, it is a best practice to use the correct getXXX method as demonstrated in the code sample above to avoid unnecessary data conversions. Use a PreparedStatement any time you have optional parameters to specify to the SQL Statement, or values that do not convert easily to strings, for example BLOBs. It also helps prevent SQL injection attacks when working with string values. CallableStatements can return resultSets, even when inserting data on the server. If the application doesn’t know if results should be returned, check for results by issuing a call to getMoreResults() after execution. 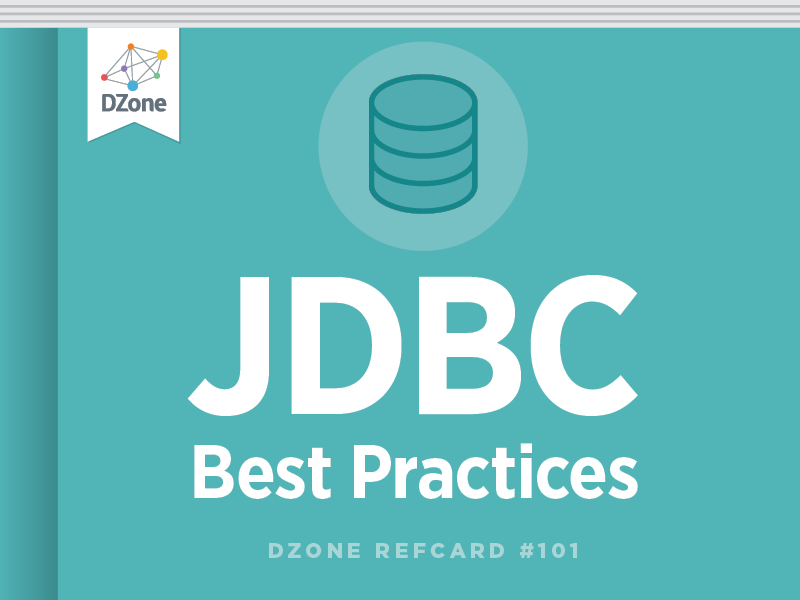 The JDBC-ODBC Bridge was the architecture that the first JDBC drivers adopted. This architecture requires an implementation of the JDBC API that then translates the incoming JDBC calls to the appropriate ODBC calls using the JNI (Java Native Interface). The requests are then sent to the underlying ODBC driver (which at the time was just a shell over the database native client libraries). The bridge implementation shipped with the JDK so you only needed the ODBC drivers and native DB client libraries to get started. Although this was a klunky and headache prone approach, it worked. The next generation of JDBC Drivers was the ever popular Type 2 driver architecture. This architecture eliminated the need for the ODBC driver and instead directly called the native client libraries shipped by the database vendors. This was quickly adopted by the DB vendors as it was quick and inexpensive to implement since they could reuse the existing C/C++ based native libraries. This choice still left Java developers worrying about version and platform compatibility issues (i.e. client version 6 is not supported on HP-Itanium processors). Some vendors still do their new development in their native clients first. So, don’t assume that if their website states that the JDBC driver supports Kerberos that they mean their Type 4 driver – they may mean Type 2! Type 3 drivers sought to be a 100% Java solution but never really gained much traction. Type 3 drivers had a Java client component and a Java server component, where the latter actually talked to the database. Although this was technically a full Java solution, the database vendors did not like this approach as it was costly – they would have to rewrite their native client libraries which were all C/C++. In addition, this didn’t increase the architectural efficiency as we are really still a 3 tier architecture so it is easy to see why this was never a popular choice. The most popular JDBC driver architecture to date is Type 4. This architecture encapsulates the entirety of the JDBC API implementation along with all the logic for communicating directly with the database in a single driver. This allows for easy deployment and streamlines the development process by having a single tier and a small driver all in a 100% java package. Type 4 drivers have been the traditional favorite of Java application developers since its inception due to the clean design and ease of use; drop in the driver jar and you’re up and running! Codeless Configuration The ability to modify options, check statistics and interact with the driver while it is running. Typically through a standard JMX MBean. Performance Architecture Drivers specifically designed for multi-core, 64 bit, and virtualized environments. Clean Spec Implementation Strict adherence to the JDBC standard, solving problems within the specification instead of using proprietary methods that promote vendor lock-in. Advanced Functionality Type 5 drivers unlock code that has been trapped in the vendor native client libraries and bring that into the Java community. Features include but are not limited to: Bulk Load, Client side High Availability, Kerberos, and others. Pooling objects results in significant performance savings. In JDBC, pooling Connection and Statement objects is the difference between a streamlined app and one that will consume all your memory. Make use of these pooling suggestions for all your JDBC applications! Statement Pooling – Setting the MaxPooledStatements connection option enables statement pooling. Enabling statement pooling allows the driver to re-use PreparedStatement objects. When PreparedStatements are closed they are returned to the pool instead of being freed and the next PreparedStatement with the same SQL statement is retrieved from the pool rather than being instantiated and prepared against the server. Don’t use PreparedStatements by default! If your SQL statement doesn’t contain parameters use the Statement object instead – this avoids a call to internal and wire level prepare() methods and increases performance! Instead of using getColumns to get data about a table, consider issuing a dummy query and using the returned ResultSetMetaData which avoids querying the system tables! Virtualization and Scalability are key factors to consider when choosing a JDBC driver. During the Performance Testing phase of your development cycle, ensure that your JDBC driver is using the least amount of CPU and Memory possible. You can get memory and CPU performance numbers from your driver vendor to see how the drivers will scale when deployed in a Cloud or other virtualized environment. Reduce network traffic by following these guidelines. Eliminate unused column data from your SQL statements Removing long data and LOBs from your queries can save megabytes of wire transfer! Below is a list of common JDBC types and their default mapping to Java types. For a complete list of data types, conversion rules, and mapping tables, see the JDBC conversion tables in the JDBC Specification or the Java SE API documentation. To illustrate what a JDBC driver does under the covers, take a look at this ‘anatomy of a JDBC driver’ diagram. These advanced features are complex and meant as an overview. For all the bells and whistles for these advanced options, check your JDBC driver documentation! Codeless Configuration is the ability to change driver behavior without having to change application code. Using a driver under something like Hibernate or JPA means that the user cannot use proprietary extensions to the JDBC objects and should instead control and change driver behavior through connection options. Additionally, codeless configuration is the ability to monitor and change JDBC driver behavior while the driver is in use. For example, using a tool like JConsole to connect to a driver exported MBean and check the PreparedStatement pool stats as well as importing/exporting new statements on the fly to fine tune application performance. Set the EncryptionMethod connect option to SSL. Specify the location and password of the trustStore file used for SSL server authentication. Set connect options or system properties (javax.net.ssl.trustStore and javax.net.ssl.trustStorePassword). Specify the location and password of the keyStore file. Either set connect options or Java system properties (javax.net.ssl.keyStore and javax.net.ssl.keyStorePassword). If any key entry in the keyStore file is passwordprotected,set the KeyPassword property to thekey password. Set the authenticationMethod connect option to Kerberos. Modify the krb5.conf file to contain your Kerberos realm and the KDC name for that realm. Alternatively, you can set the java.security.krb5.realm and java.security.krb5.kdc system properties. If using Kerberos authentication with a Security Manager,grant security permissions to the application and driver. These security features are not supported by all databases and database versions. Check to ensure your database is setup appropriately before attempting Kerberos and SSL connections. Connection Failover In the case of the primary connection being unavailable, the connection will be established with the alternate server. Extended Failover While the application is running, if a connection failover occurs, the driver will reconnect to an alternate server and post a transaction failure to the application. Select Failover Same as extended, except instead of posting a transaction failure, this level will reposition any ResultSets, so the application will not know there was a failure at all. Set enableBulkLoad connect option to true. This will make addBatch() calls use the bulk load protocol over the wire. For additional Bulk Load options, check the JDBC driver documentation. To get a listing of the functions supported by a given JDBC driver, use the getter methods on the DatabaseMetaData object: getStringFunctions(), getNumericFunctions(), getTimeDateFunctions(), etc. % (percent) Subsititute for zero or more characters. _ (underscore) Substitute for exactly one character. [charlist] Any single character in the charlist. [^charlist] Any single character not in the charlist. When choosing a driver to use with Hibernate, ensure your driver supports Codeless Configuration so that you can tune performance and change driver behavior without having to modify the Hibernate code! Dialects (org.hibernate.dialect. *) Describes the SQL behavior of the JDBC driver and database to which the application is connecting. Configuration File (hibernate.properties or hibernate.cfg.xml) Contains the hibernate configuration settings, such as: JDBC driver and connection information, dialect information, mapping information, etc. Mapping File The mapping file contains the mapping between the application defined objects and the relational data stored in the database. Not all JDBC drivers are created equal! Look for a set of JDBC drivers that can use a single dialect to connect to multiple versions of a database. There’s nothing worse than deploying your application with an Oracle 8 dialect and discover that you need to redeploy with an Oracle 10 dialect! What's Even Harder Than Dates and Timezones? Dates and Timezones in SQL / JDBC! \n % (percent) \n Subsititute for zero or more characters. \n _ (underscore) \n Substitute for exactly one character. \n [charlist] \n Any single character in the charlist. [^charlist] \n Any single character not in the charlist.